I missed my Listening, Wearing, Making post last week, not for lack of music (and more) to share with all of you, but mainly because before I knew it it was Friday and I still had so much work to get to! But I'm back this week with what I think of as some of my "classics" or all-time-favorites. Starting with some Rodney Crowell. I love his music, and love the music of many of the women he's worked with (and had relations with) throughout his long career. Musicians like Emmylou Harris, Rosanne Cash, and more. This video starts out with Crowell giving some background for the story behind the song. It's from his 2006 album The Houston Kid. Wearing: This locket. I bought it ages ago from the Etsy seller Rose and Anchor. The photo under the glass cabochon is of a moth, and is original photography by the maker. There's something about the perfect locket that feels decidedly feminine. . . and slightly secretive as you can put whatever photo memory you like inside and then have it always close to you as you go about your day. Making: many travel stone necklaces. These guys are insanely popular at most of the craft fairs I sell at, and since I'm gearing back up for fair season, there's been a lot of making of these delicate pieces. I love wearing a bunch of them all layered together at once. Lastly, don't forget I'm having my Valentine's Day sale in my Etsy shop until Valentine's day. Simply use the coupon code "valentine" and you'll receive 25% off your entire order. 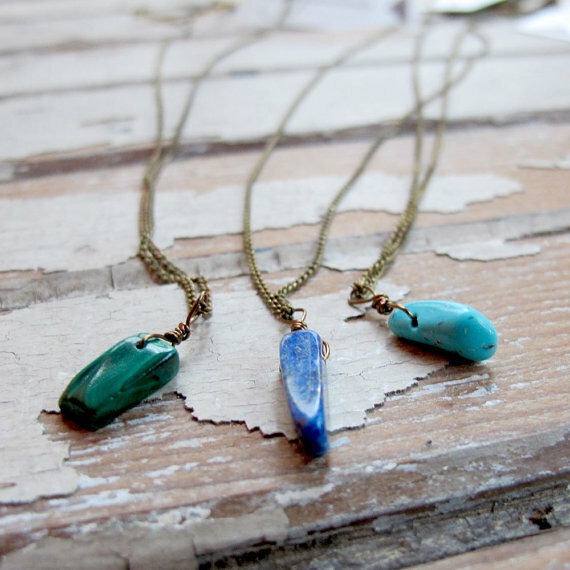 Perfect for snagging some of these travel stone necklaces!